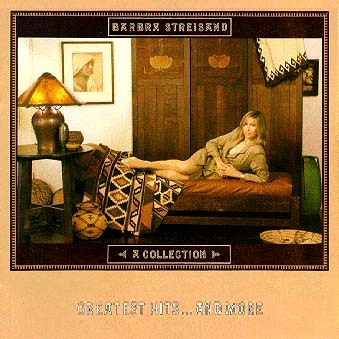 The Ultmate Barbra Streisand Album Experience: "A Collection Greatest Hits...And More"
Producers: Barry Gibb, Albhy Galuten, Karl Richardson, Andrew Lloyd Webber, Narada Michael Walden, Phil Ramone, Bob Esty, Michael Masser, Rupert Holmes, Jeffrey Lesser, Dave Grusin, Barbra Streisand, Peter Matz, Charles Koppelman. - All songs on this compilation were previously released except "We're Not Makin' Love Anymore" and "Someone That I Used To Love." - "We're Not Makin' Love Anymore" was released in an edited form (4:28) on a single. A video was also made for the song, using yet another edit version (4:57). - "Someone That I Used To Love" was released as a promotional single. - "We're Not Makin' Love Anymore" was co-written by Michael Bolton. - To purchase this album, please click the banner below to visit amazon.com. ©1996-2001 The Ultimate Barbra Streisand Experience. Heath David Castor, Webmaster.